Seems there are many irons in many fires the last month, but unfortunately we didn't shoe many horses for it. 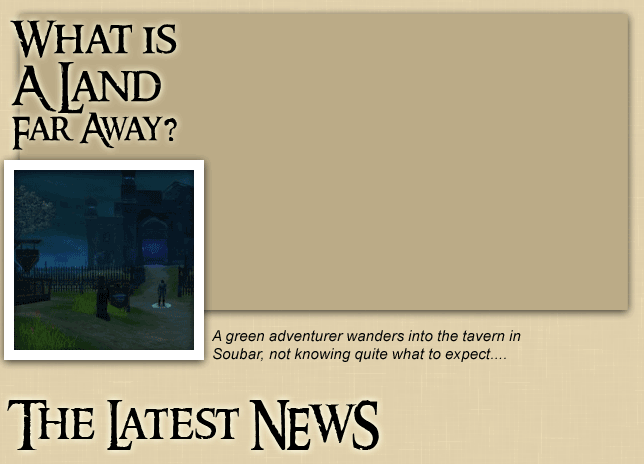 Work continues on Greengrass, random dungeons, an ACR release, and video tutorials. IA Election -- a formality as always, we held elections for Infra Admin. FoamBats4All stood uncontested and was confirmed for another six months. PA Election -- Mikayla ran for Player Admin again and is confirmed to the post for the next six months. New Host -- our central server has moved! If all is working, we should see more-spritely play as our database is now much closer to our game servers. TA Election -- the one that our previous Lead Administrator missed in November ran, with Zelknolf confirmed for another term. DM Events -- DMing has been picking up lately, with events coming into play from Adanu on Western Heartlands, Xanthea on Moonshaes, Shad0wfax on Baldur's Gate and Rumple C on Baldur's Gate while the going event from Zelknolf continues to run on Moonshaes. Build -- Wynna has returned from a long hiatus, and has taken to repairing the static content in Silverymoon University. She announced a complete build just before this post's authoring, and we expect to see it on The Silver Marches soon. Lead Administrator Election -- We have a new L.A. this month. HEEGZ will be taking up the post this term and on for the next six months. ALFA1 Waterdeep -- Our NWN1 Waterdeep server has been started up again and runs as a campaign server. Intro Quest Expansion -- Baldur's Gate's intro quest now takes you a little bit further, walking you from Beregost to Candlekeep, and teaching a little bit avoid avoiding threats on less-patrolled roads. Things still afoot this month! Infestations -- mentioned last month are in play this month. Story Quest -- Baldur's Gate has acquired a new quest chain which runs out of Ruqel. CR 3, and very large in scope-- requiring several hours (and probably breaks to rest and recover abilities) to complete. Players will need to complete the existing Westra chain to flag it. Ship Battles -- Moonshaes is in the process of upgrading its mechanics for ship battles, allowing sailors to smoothly transition between being at sea, engaging a hostile ship at range, and boarding-- or being boarded-- by enemies on that ship. We expect it to be live within a week. DMA Election - Castano stood for the office again, and has been confirmed as the continuing DM Administrator. At the end of the vote of confidence, he's hinted at plans from the DMA to lure more participation to ALFA. Infestations - our tech system to allow servers to declare regions to contain a (potentially-spreading) infestation of creatures, and thus causing all of the spawns in that region to be replaced with something else, continues significant progress and enters end user testing this month; it should be entering play soon.